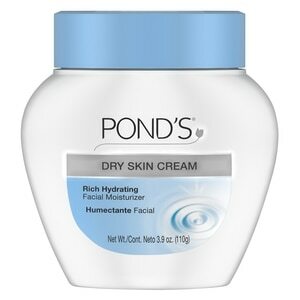 Pond's Dry Skin Cream is a face moisturizer that moisturizes deeply and preps Skin for makeup application. With so many different options in the market for skin care products, it is hard to determine what product is best for you. The first step is identifying what type of skin or skin need you have: dry skin, oily skin, combination skin, etc. Then understanding what product has the right formulation and ingredients for your skin type. For those with dry skin, it is important to find a formula that will retain moisture and deeply hydrate. Pond’s Dry Skin Cream, is a rich hydrating facial moisturizer, suitable for those with dry and/or sensitive skin. This rich creamy formula is easily absorbed in the skin, and locks in moisture, to hydrate deeply while significantly reducing dryness. Pond's Dry Skin Cream can be incorporated into your beauty routine, both morning and night. For your morning, it is the perfect base to moisturize your skin prior to applying your makeup. Also apply after you cleanse at night. Pond’s Dry Skin Cream provides deep instant hydration Essential Ingredients: Occlusive-help prevent moisture from leaving the skin. Humectants-deeply hydrates to keep moisture within the skin. For soft, smooth and radiant skin, put your trust in a classic. Massage gently over face and neck. For external use only. If product gets into eyes, rinse thoroughly with water.